Sheldon Cooper (narrative): I've always loved trains. In fact, if my career in theoretical physics hadn't worked out, my backup plan was to become a professional ticket taker. Or hobo. 5.11.2017 Become a professional ticket taker. Or hobo. 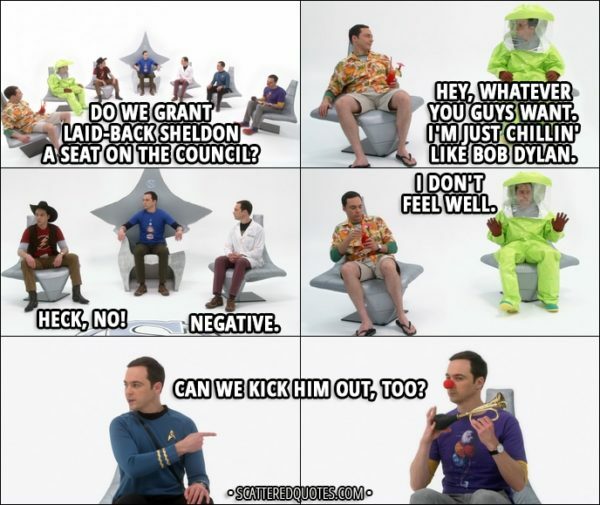 16.10.2017 Do we grant Laid-Back Sheldon a seat on the council? 16.10.2017 Outdoor wedding. I know what I’ll be using that cliff for. 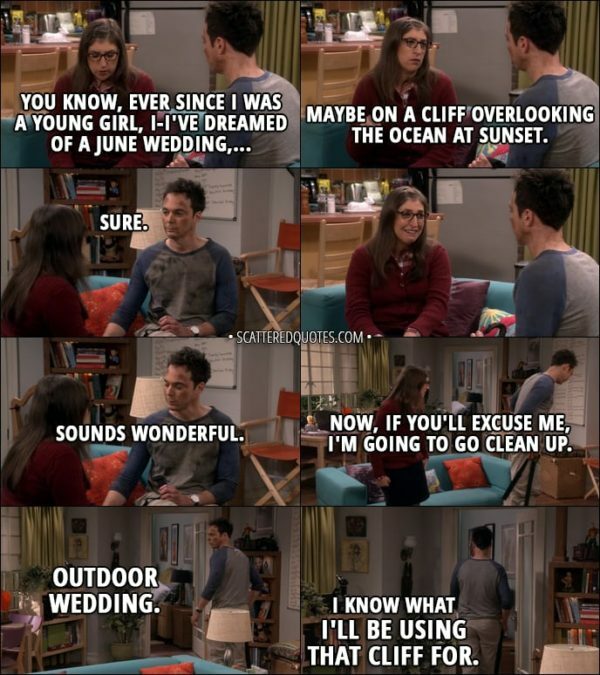 Sheldon Cooper (to Amy): I want you to be in charge of our wedding. Just you tell me where and when, and I will show up with a boutonniere and close-toed shoes and a... a Star Trek uniform underneath my tuxedo. That last part is non-negotiable. 16.10.2017 Star Trek uniform underneath my tuxedo. Sheldon Cooper: You're proposing that the self is an illusion, and that we actually have multiple centers of consciousness that are communicating with one another? Penny Hofstadter: In laymen's terms, yeah. Sheldon Cooper: Huh. Interesting. So you don't believe there's a Cartesian self that underlies the flux of experience? Penny Hofstadter: Maybe in my twenties, not anymore. 16.10.2017 Maybe in my twenties, not anymore. Amy Farrah Fowler: It's plausible that when we're asleep, aspects of our personality that we repress might come out. Sheldon Cooper: Don't try to put science lipstick on your New Age pig! And for the record, you make noises when you sleep, and I've never accused you of repressing your inner chainsaw. 16.10.2017 I’ve never accused you of repressing your inner chainsaw. Sheldon Cooper: I see why you turned it off. That guy sounds like an idiot. Penny Hofstadter: Honey, that's you. Sheldon Cooper: Don't be silly. My voice is deep and sonorous. Like a Caucasian James Earl Jones. "Luke, I am your father." See? 16.10.2017 My voice is deep and sonorous. Sheldon Cooper: I found the perfect wedding date. Amy Farrah Fowler: That's terrific! Sheldon Cooper: No, it's not. It was May 19, 1996. We would have had a lovely wedding. And our honeymoon would have coincided with the first appearance of the Hale-Bopp comet. Amy Farrah Fowler: Sheldon, you were 16. Sheldon Cooper: And in Texas... no one would have batted an eye. Oh, wait, it's no good. That's the day that Jon Pertwee, the third Doctor Who, died. Amy Farrah Fowler: And it's in the past! 16.10.2017 It was May 19, 1996. We would have had a lovely wedding. Sheldon Cooper: It's not just a date... it's a textbook optimization problem. There is a perfect date... just like there's a perfect room temperature and a perfect dessert. Penny Hofstadter: Mm. There's no perfect dessert. Sheldon Cooper: Yellow cake in the shape of a dinosaur with chocolate frosting, a scoop of vanilla ice cream on the side, not touching. You'll see. You'll have it at our wedding. 16.10.2017 It’s a textbook optimization problem. Sheldon Cooper: On the bright side, after working together for 15 years, you finally get to hear me say, "You were right." Leonard Hofstadter: Oh, yeah, you did. Sheldon Cooper: How's it feel? Leonard Hofstadter: Mm, given I might be unemployed, bittersweet. Sheldon Cooper (about Leonard): He publicly maligned the love of my life, Lady Physics. Howard Wolowitz: You might not want to mention that to Lady Fiancée. 10.10.2017 He publicly maligned the love of my life, Lady Physics. Bernadette Rostenkowski-Wolowitz: I'm obviously pregnant. Sheldon Cooper: Well, you never said it to my face. And the last time I assumed a woman was pregnant, it did not go over well. Penny Hofstadter: Yeah, I'm still mad at you. Sheldon Cooper: You were drinking water instead of wine. What was I supposed to think? 10.10.2017 You were drinking water instead of wine.